A graded approach is adapted and individualised to all patients to allow supported progression to unescorted leave. We are a community facing service and have links to local colleges, voluntary work programmes and recovery based services. Exploring the pathway of recovery, where the patient has come from, where they are now and where they want to be in the future. Positive goal setting with realistic steps reviewed with the MDT. Developing personalised plans, understanding triggers, relapse signatures and having crisis plans available. Encouraging cooking skills using a tiered approach, allowing for support to be given in an individualised manner with the overall goal of enabling independence through full self catering where appropriate. A tiered approach adapted to each individual to encourage and enable progression towards self medicating with monitoring, support and education. Families will be supported, involved and sessions offered to offer information about different diagnoses, medication, risk management and coping strategies. sessions offered to offer information about different diagnoses, medication, risk management and coping strategies. A supportive approach to discharge involving robust planning, collaborative working and graded methods where needed with follow up contact from Draper House staff to enable a seamless supportive transfer. an integrative, mind-body based approach that helps people to manage their thoughts and feelings and mental health. Mindfulness exercises are ways of paying attention to the present moment, using techniques like meditation, breathing, and yoga. Staff and patients will be encouraged to partake in mindful activities. Working together to enable individualised and effective support. The environment is designed to offer a rehabilitation service with all areas of the service encouraging the development and maintenance of independent living skills. There are 2 floors each with 7 bedrooms all with en-suite bathrooms, the rooms are designed to replicate that of a small bedsit with a bathroom, bed area and living area which would be provided within normal community/supported living. There is a communal kitchen with dining area and lounge to encourage social interaction and integration. A large activity room and ADL kitchen is also available and landscaped areas around the building with a perimeter fence ensuring safety and security is maintained. As a new service we will continue to develop, utilising feedback, audit and changes in best practice. We will utilise AIMS standards and QUIRC for self-assessment of our service. Feedback from patients, carers and staff. Additional psychometric measures are used, as deemed appropriate, pre and post therapeutic intervention and/or specialised treatment to assess clinical change. 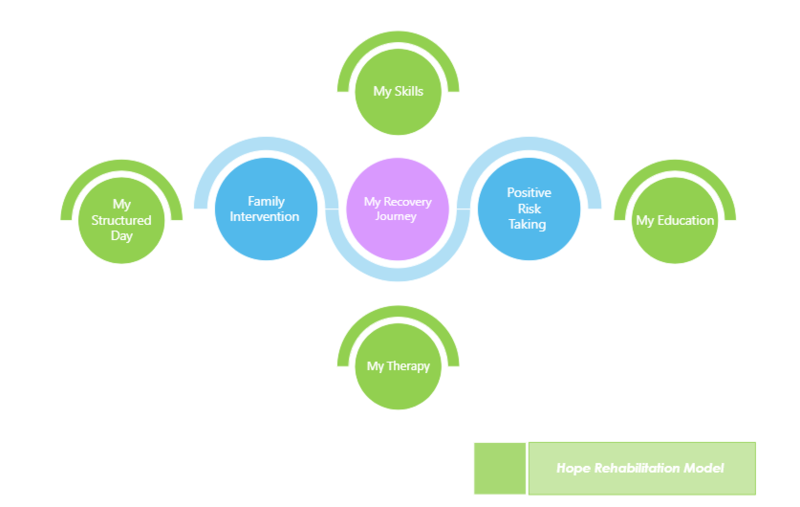 The Hope Model has been developed by KR Health and Social Care, the focus of the model is placed upon the service user’s personal recovery journey, with the emphasis on the pathway, their goals and the future. The model itself incorporates five core domains which form a bespoke pathway chosen by the Service User, the family and the care team and is tailored to individual need. For each domain a toolkit of accessible interventions is available as part of their treatment programme which is determined with the service user based on their individual needs. Our treatment programme is designed to support patients through their recovery pathway, this will include reducing symptomology, stabilising and supporting patients to utilise effective coping strategies. We will encourage patients to develop their own effective management strategies, structure their days, plan for the future and reintegrate into the community. The treatment plan will be based upon thorough psychological formulation and the HOPE rehabilitation model utililsed to deliver a bespoke treatment plan for individuals delivered by an experienced MDT.